When he finds himself in the middle of a dangerous plot unfolding in the streets of San Fransokyo, robotics prodigy Hiro Hamada transforms Baymax—into a high-tech hero in “Big Hero 6.” ©2014 Disney. All Rights Reserved. HOLLYWOOD—For seven seasons, Scott Adsit played comedy writer/producer Pete Hornberger on the hit NBC series “30 Rock.” Balding, with sad dog eyes, he was “the sane one” among the lunatic cast and crew involved in the fictional sketch comedy show-within-a-show, alongside put upon head writer Liz Lemon (Tina Fey). A veteran comedian, who trained at the famed Second City in Chicago and did stand up for years, Adsit has paid his dues in the film and TV world as a supporting player. He previously lent his voice talents to the stop-motion animated series, “Mary Shelley’s Frankenhole,” which ran for two seasons on Cartoon Network’s “Adult Swim,” starting in 2010. Q: Have you met Ryan Potter, who provides the voice of Hiro, the teenager whom Baymax takes care of as a personal healthcare companion? Adsit: We only met last week. We’re still exploring each other. Q: It must be a weird sensation to be in a film with other actors and not see them until you’re doing press. Adsit: Absolutely. I think we feel an affinity for each other because we know each other through the characters, so there’s an undeserved familiarity right now among us as if we’ve been in the same company now for a year or two. Q: What did you think of Baymax when you saw him for the first time? Adsit: The first time I saw him was at my audition, because they’d already designed him. What that did was help me understand what that voice should be. Before I walked in, I wasn’t sure. Then I saw the design, and I realized I had that voice already in my head and I could do it fairly easily. We worked on it a little bit at the audition for a full hour. I’d never had an hour-long audition before, and it was great. It was the best audition I’d ever experienced. It felt like I already was on the job. That was a thrill, especially being in (at Disney’s animation building) and doing it, walking down the halls and looking at all the artwork. It’s really an honor to be in (the film). That first audition I think I understood what (Baymax) needed to be because I saw the picture. Q: What did you think of him? Adsit: He’s so huggable. I was looking for a huggable voice. He’s so benign. I knew that the voice had to be user-friendly and gentle. He’s a caregiver, a nurse, essentially, so he’s got to have a 24-hour bedside manner. Q: Did you look at other depictions of robots on TV or in film? Adsit: I’m a big fan of science fiction, so I know all the robots already. I know the guys who designed Baymax, from Don Hall and Chris Williams all the way down, were looking for a new kind of thing, and so they found this huggable design. One of the things they saw when they went to research is this inflatable arm that is soft and can manipulate people without hurting them. So they built Baymax around that concept. In the Marvel comic book, he’s kind of a warrior or a chauffeur, sometimes. They found this arm and that became Baymax. That led me to the voice I was talking about. In this world, we don’t want to talk to robots. They try to make it as human as possible, but it’s not. It’s close, but it’s not quite it. So that’s what I went for. Q: What nuances with your voice did you develop? Adsit: It was very collaborative. There were very few notes from the booth about “make it more this” or “make it more that.” They liked what I did at the audition, I guess, so they didn’t do that. The only notes I got were things like, “less emotion.” I went though it a lot without many notes. They’d say, “Great. Next one. Great. Next one.” Then we started doing the low battery bits, and then they’d just let me play. Then it was just like, “Have fun” or, “Here are some suggestions,” but otherwise they just wanted me to have fun. It was two days of doing what is essentially “drunk voice.” The funny thing was when we were in the booth, I asked, “So this is a drunk robot?” And they said, “No, just be drunk.” That was very freeing because then I didn’t have to think about it other than the joy of being inebriated … which I’ve done once, for research, in 2009, just in case. Q: What went into the physicality of your character? Adsit: I was trying not to be too physical in the booth. I was holding my hands together and it was almost as if I were praying. I kept myself very tight. Q: I’ll bet this film is going to give you brownie points with the kids in your life. Q: Are they aware that you’re the voice of Baymax? Adsit: I’ve had a few kids in my life where their parents have told them that I’m the “guy in the commercials,” at this point. They love the commercials already so that’s very satisfying. I’m always worried if they’re told, “That’s Baymax!” then I’ll just scare them because I’m not Baymax. I’m this scary, one-eyebrowed bearded guy. So far, that has not happened. They’ve been very happy to meet me and understand that I’m the voice of Baymax and tell me why they love Baymax, very calmly. Adsit: I did a pilot for AMC called “We Hate Paul Revere,” which is a single-camera sitcom based in colonial Boston. It’s very accurate. Adrian Wenner and Ethan Sandler also star in it. I play Sam Adams. Ron Livingston plays Paul Revere. We are the one-percenters. I know that Sam Adams is not a beermaker. It’s about two silversmiths who are overshadowed by Paul Revere, who is a jerk. It’s very smart and very funny. It’s beautifully costumed. The director of photography is Matthew Clark, who also was our DP on “30 Rock.” Everything looks amazing. In the middle of it is this witty dialogue and funny and silly characters. It’s really good. 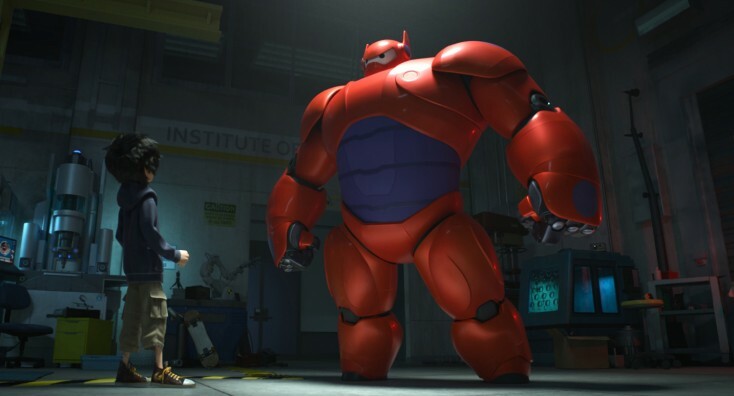 Q: Have you seen “Big Hero 6” yet? Did you tear up during the sad or emotional parts?